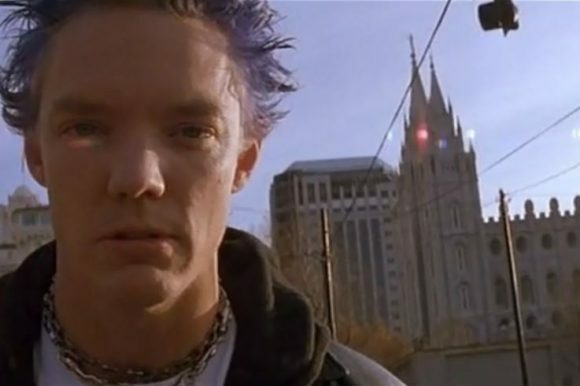 In 1998, Utah’s counterculture would be defined by the dyed mohawks, scrappy clothes, and dilapidated apartments of two punks who revel in their social tribes and adamantly reject the mores of conservative Salt Lake City. SLC Punk is the loosely-autobiographical brainchild of James Merendino and hearkens back to his teenage angst after transitioning from New Jersey to the quiet suburbs of Utah. Merendino channels his youth by utilizing the formative locations he grew up around within Salt Lake County – including the Cathedral of the Madeline, the former Cottonwood Mall, and the streets of West Temple. At its forefront, the film aims to be no different than its protagonists: subversive and alienating. However, behind the thin facade of grit and grunge is an uncompromising satire on identity and community. Featuring Matthew Lillard, Michael Goorjian, and an early performance from Jason Segel, Merendino’s eccentric cast of characters aimlessly revolt against social norms, all in the pursuit of an anarchic utopia – one which may prove to be out of reach. By channeling the relentless energy of its lead performances, the film freely peppers in a series of jump cuts, freeze frames, and kinetic camera movements. It’s aesthetic borrows from the likes of Penelope Spheeris and her docu-series The Decline of Western Civilization but isn’t concerned with sharing the same hard-hitting tone. On the contrary, SLC Punk functions best at its most outlandish. The juxtaposition between its characters and their comparatively tame environment provides plenty of comedic moments which are occasionally punctuated by real-world consequences. In those fleeting moments, SLC Punk offers more than its rebellious veneer would like you to believe – which would turn out to be early indicators of a future cult classic. However, the road to cult status would prove difficult. Following its release at the 1999 Sundance Film Festival and despite its critical acclaim, SLC Punk was initially rejected by its own community of punks and unsurprisingly, the conservative-minded within the state – who were torn between the depiction of its disaffected youth. Ultimately, the polarizing reception would come to reflect the narrative’s central conflict – is it punk or is it just another poser? Despite its division, (which has arguably worked in its favor) SLC Punk has proved to define a generation – perhaps one that never manifested in reality, but rather, within the spirit. In 2016 James Merendino would revisit his punk rock world with an array of new faces and the return of Michael Goorjian, who reprises his role as the ironically named “Heroin Bob.” Both SLC Punk and it’s sequel, Punk’s Dead, are available to stream on Amazon Prime and Google Play.